The Romans, came, they saw and they conquered. But they left no genetic imprint. The same goes for the Vikings and the Normans, with the exception of the Orkney Islands, which were Norwegian for 600 years. Nevertheless Viking DNA only accounts for 25% of today’s Orcadian DNA. 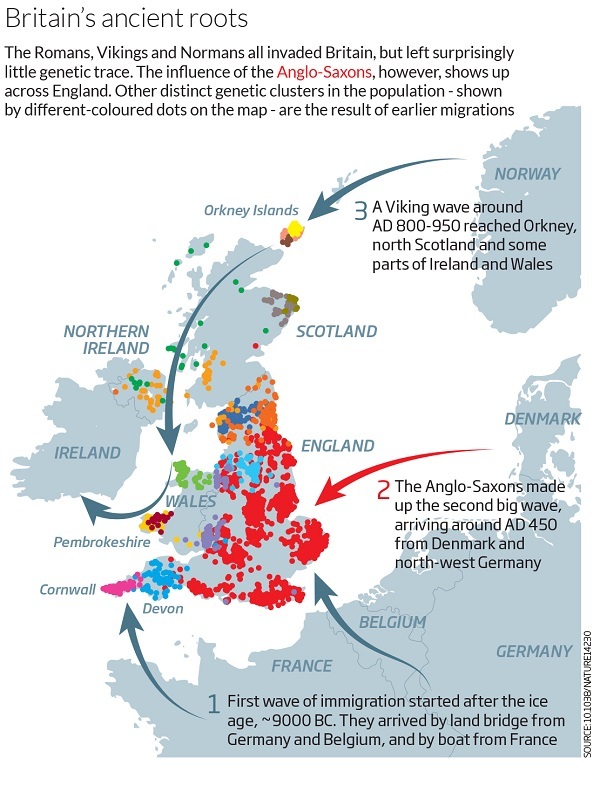 The New Scientist reports on DNA mapping undertaken of Britain’s Caucasian population. To qualify for sampling people had to have all four grandparents born within 80 kilometres of each other. So I guess there’d be a bias towards clustering, and clustering is what they got. There were two main findings. First, the only invaders to leave a distinct genetic genetic footprint were the Anglo-Saxons in the east and the south, who arrived from AD 450. Still the DNA of earlier settlers dominates, with at least 60% deriving from earlier immigrants. Secondly, there is considerable variety in the DNA of those earlier settlers, especially in the west and the north. In the south and the east the effect of the Romans was to dissolve somewhat the tribal clustering, partly through building roads. The article does not mention language. English, of course, is a Germanic language which came with the Anglo-Saxons. German as a language only developed from about 500-0 BC in what is now southern Scandinavia. The Germans emerged from the north onto the main European continent and beyond from about 0 AD. The Celts were already there. But the Celtic language only dates from about 1350-850 BC and appears to have arisen in central Europe. It’s part of the Indo-European family, which arose far away in the steppes north of the Black Sea, probably around 4000 to 3000 BC. Quite obviously the early settlers of Britain spoke something else. But the Celtic language when it came took over to become the language of the masses. Whether this was a matter of sheer numbers, or cultural influence I don’t know. How this all came to be goes beyond my pathetic knowledge of ancient history. Annastacia Palaszczuk has put her premiership on the line by sacking Billy Gordon, the Member for Cook, from the ALP and asking him to resign his seat. The state of the parties now is that the LNP has 42, the ALP 43, the Katter Party has two and there are two independents, Peter Wellington and Billy Gordon. To govern a party needs 45 votes, including the casting vote of the speaker, currently Peter Wellington. wants Labor’s commitment on improving regional roads, water development, mandating ethanol in fuel and setting up a rural development bank. This whole matter was raised by Geoff Henderson on the NSW election thread. For posterity I’ll attempt to outline the relevant information here. Served with an Apprehended Violence Order in 2008 after a complaint by his mother. I understand he also falsified tax returns to avoid paying child support. Furthermore on Friday Palaszczuk referred Gordon to police amid allegations he abused a former partner a decade ago. Gordon has deceived the public, the ALP in pre-selection and Palaszczuk said he looked her in the eye and lied to her. He should resign from parliament. Mr Gordon, the member for Cook, said in a statement he was weighing up his options and needed time to seek further legal advice and discuss the matter with his family and supporters. “I am very concerned that I should be afforded natural justice in any determination that my tenure as the Member for Cook should be terminated because of [the Premier’s] move to see me expelled from the Labor Party and her wish for me to resign as a Member of Parliament,” the statement said. “The Premier has previously requested that the Police Commissioner investigate whether I have transgressed any law and that process should be allowed to continue its natural course. He said in the statement he had a “serious eye operation” on Monday. Legally Professor Graeme Orr of Queensland University said Mr Gordon could only be forced to resign from Parliament if he served more than a year in jail. A question has been raised as to whether Labor should accept Gordon’s vote. Personally I think this would only further disenfranchise the citizens of Cook. Meanwhile the Katter Party are asking quite a lot of a cash-strapped government. The alternatives then are trying to govern as a minority government, or going to the people. Katter plus LNP does not add up without Wellington, and it is doubtful that he would give the LNP a go. I understand that the LNP in post-polling analysis believe that dislike of Campbell Newman was worth about 7% to Labor. On that basis they would expect to win in a canter. Graham Young who has also done some polling believes that there was a significant “protest vote element” of people wanting to send the Newman government a message, but not wanting to elect Labor. Update: Gordon holds Cook on a margin of more that 6%. According to the ABC story, some shelves lost almost 20% of their thickness. Melting ice shelves does not itself cause sea level rise, but the shelves buttress land ice, which then becomes more mobile. 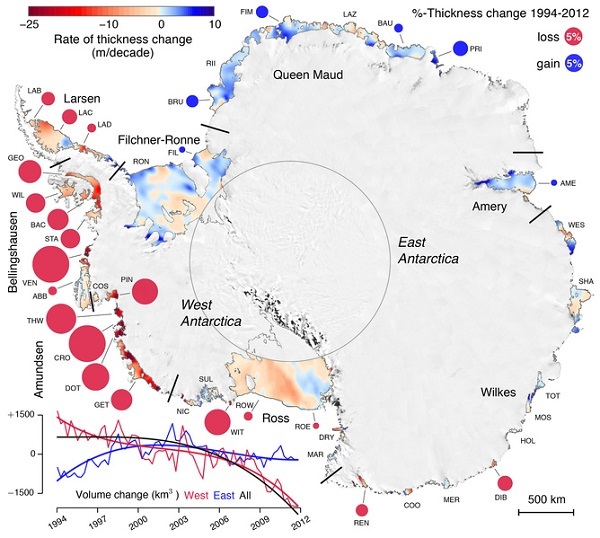 The graph in the bottom corner of the image shows that East Antarctica is now also experiencing a net loss of ice from ice shelves. ANU economist Frank Jotzo said the system is designed so no-one gets caught by it – a toothless tiger. Tony Wood of the Grattan Institute said the ideas proposed in the paper simply would not work. 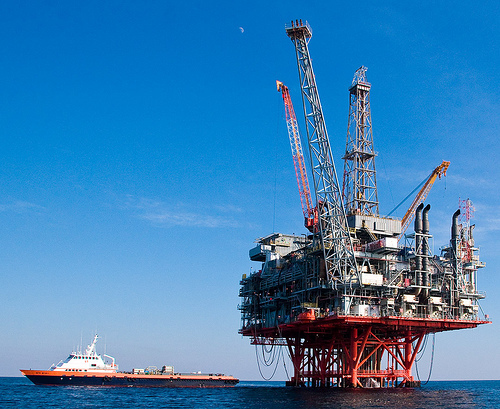 They were commenting on a Government consultation paper outlining “safeguards” to ensure the big polluters do not offset emissions saved through the Emission Reduction Fund (ERF), a flagship component of Direct Action. Australia’s 140 top polluters will set their own limits for future pollution virtually penalty free, according to the Government’s latest Direct Action policy paper. Companies subject to the safeguards will select a baseline, or limit, for future pollution. That baseline will be set according to the highest peak of emissions from the past five years. 3. What’s going on in the North Atlantic? Stefan Rahmstorf asks the question at RealClimate. 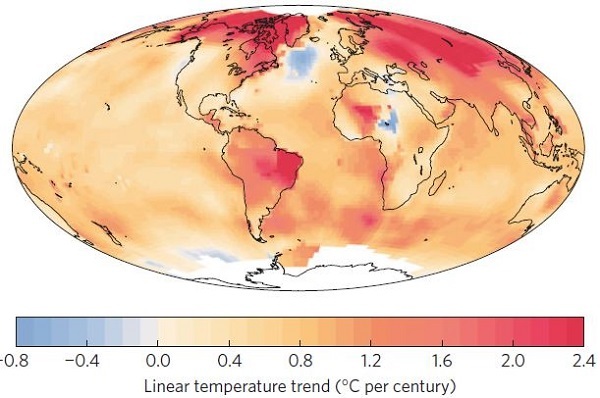 There is a large patch in the North Atlantic which has cooled in the last century. Our recent study (Rahmstorf et al. 2015) attributes this to a weakening of the Gulf Stream System, which is apparently unique in the last thousand years. In fact during last winter, which was the warmest on record for the planet overall, this patch had the coldest temperatures on record. Chief suspect has to be the increasing freshwater coming off Greenland. There will be consequences. The consequences of a large reduction in ocean overturning would look nothing like the Hollywood film The Day After Tomorrow. But they would not be harmless either – e.g. for sea level (Levermann et al. 2005) particularly along the US east coast (Yin et al. 2009), marine ecosystems, fisheries and possibly even storminess in Europe (Woollings et al. 2012). A complete breakdown of the current was given up to a 10% chance this century in the IPCC report. This may have been an underestimate. Another study, also involving Rahmstorf, looks at changing atmospheric circulation patterns due to Arctic warming. The Arctic is warming faster than lower latitudes. The Jetstream velocity depends on temperature difference, hence it is slowing. It is also more wavy and has a tendency to get stuck, so heat or cold persists over a large area. Ironically, there is less storminess. Storms transport water onto land and break up persistent weather patterns. The jet stream that circles Earth’s north pole travels west to east. 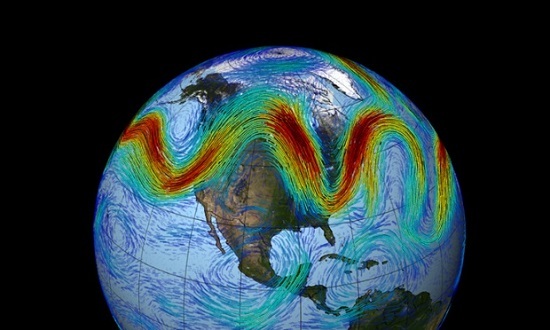 But when the jet stream interacts with a Rossby wave, as shown here, the winds can wander far north and south. Brisbane-based electric vehicle infrastructure company, Tritium, has done a deal to supply its award-winning Veefil DC fast charging stations to America’s ChargePoint company. ChargePoint has 21,000 EV chargers around the US. The Australian-made stations will be installed on major routes across the country, including the express charging corridors on both the east and west coasts of the US that are being built as part of a recent deal between ChargePoint, Volkswagen and BMW. The 50kW Veefil stations – which in the US will be called DC Fast stations and will be ChargePoint branded – are able to deliver up to 80 miles or 128 kilometers of charge in just 20 minutes, thus removing one of the key barriers to EV uptake: range anxiety. The Morgan Poll has Mike Baird’s LNP a clear leader at 57.5-42.5 over the ALP, so an even race would be unexpected. If the win turns out to be 51-49 or even 52-48 questions will be asked about the influence of Abbott’s leadership travails, but that looks extremely unlikely. Of interest will be whether the Greens can get themselves into second place in one or two of the northern seats and win on preferences. Antony Green points out that there is a second election taking place, one that is crucial if the LNP is to proceed with it plan to privatise half the electricity distribution system. NSW of course has an upper house, the Legislative Council, where the LNP has only 19 of the 42 members. The ALP has 14 and the Greens 5, leaving the balance of power with the Christian Democrats (2) and the Shooters and Fishers(2). After the LNP elects one member as president it has only 18 votes, hence has needed both minor parties to get the required 21 votes to pass legislation. An important sticking point is that Shooters and Fishers Party opposes the privatisation of electricity. 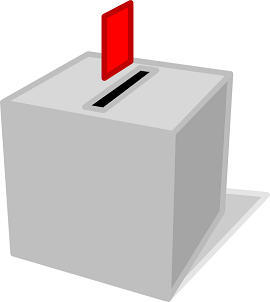 A term in the Legislative Council is eight years, so half the members face election each time. This time the LNP has 11 continuing members and 8 facing election. It needs to elect 9 to have the numbers to pass its privatisation legislation with the help of the Christian Democrats. Green reckons the LNP needs about 39% of the first preference vote to get 9 members elected. Morgan has them on 49% of the primary vote, so with the quota 4.55% it should be a cake walk. On that basis they could get 11, as they did last time. If so they’ll be home free without needing anyone else’s vote. With 9 members elected the LNP would be in a situation where it could pass any legislation with the assistance of just one of the minor parties, assuming that both the Christian Democrats and the Shooters and Fishers elect one member each to add to their continuing single members. These minor parties typically need just 2 to 2.5% of first preference votes to achieve a quota of 4.55%. In 2011 Pauline Hanson failed on 2.5% because she attracted very few preferences. Oddly other polls seem to favour the ALP less than Morgan. Essential has the LNP ahead only 53-47. Newspoll is on 55-45. Altogether, though, it looks like a good news day for the LNP. Elsewhere, Peter John Chen has a more comprehensive review of the election and the issues involved. a completely new universe will be revealed – rewriting not only the physics books but the philosophy books too. 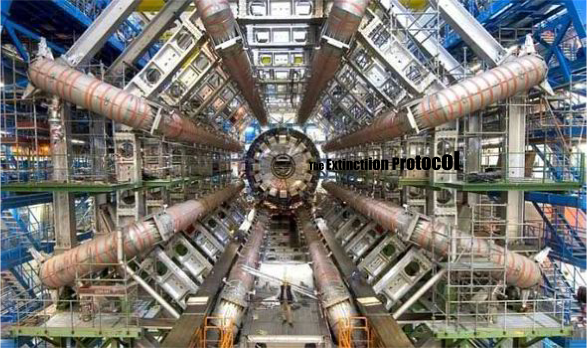 It is even possible that gravity from our own universe may ‘leak’ into this parallel universe, scientists at the LHC say. As mentioned at Mark’s Facebook, if they want a parallel universe a plane ticket to Australia might be cheaper. Either opinion is swinging wildly or the pollsters have lost it. Two weeks ago there was a significant crossover of Newspoll and Morgan. Now they’ve crossed back again. Morgan has a 2.5% swing to to ALP, putting them on 56/44 TPP. Newspoll has a 4% swing the other way to leave Labor barely ahead on 51-49. Essential has a 2% swing to Labor this week to leave it comfortably ahead on 54-46. Essential’s weekly poll has been reasonably steady over a four-week period. They call it the tide of the century, but it actually happens every 18 years. 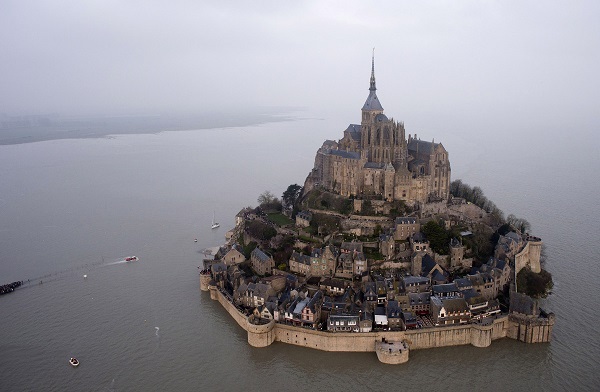 Mont Saint-Michel is a tidal island off the coast of Lower Normandy. Acessible by a causeway at low tide, the tide comes in at the speed of a galloping horse. Mont Saint-Michel receives over three million visitors each year. Adani’s Carmichael mine in the Galilee Basin is planned to mine 60,000 tonnes of coal per year, creating 10,000 direct and indirect jobs. Adrian Burragubba as spokesman for the Wangan and Jagalingou Family Council says that under native title they do not approve of mining in any shape or form and no amount of money will change their mind. We’re concerned that it will devastate the land beyond repair. It will destroy the waterways and our totemic animals and beings that are on that land and our ancestor dreaming stories and those things that are associated with our culture and heritage. And it will also destroy it beyond repair to the point where we’ll be displaced forever from that land as the original custodians of that land. It seems that the native title claim substantially overlaps with another native title claim lodged by the Bidjara people. If the claim cannot be settled between the groups then the Federal Court will test the matter at trial. 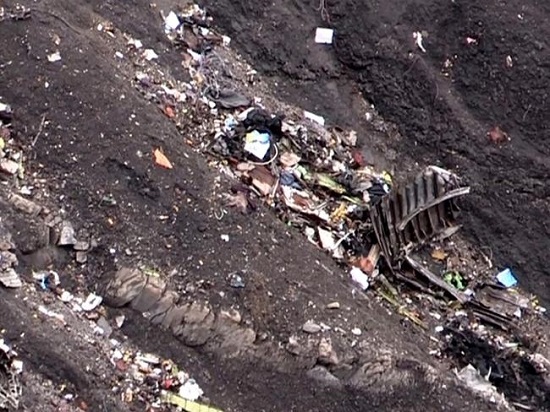 First it was a leak, now officially confirmed, the pilot of the doomed flight was locked out of the cockpit by the co-pilot during the eight-minute descent prior to the crash in the French Alps. Apparently there was repeated knocking on the door without response and then an attempt to smash the door down. The co-pilot can be heard to be breathing to the end. The co-pilot was a relatively experienced 28-year old officer, who lived with his parents. On the 7.30 Report we were told that in the US if a pilot leaves the cockpit there must be a second crew member present, typically the chief flight steward. In Europe and indeed Australia that is not the case. Since 9/11 and Twin Towers unauthorised entry into the cockpit is virtually impossible. The Airbus A320 plane is designed with safeguards to allow emergency entry to the cockpit if a pilot inside is unresponsive, but the override code known to the crew does not go into effect and indeed goes into a five-minute lockdown if the person inside the cockpit specifically denies entry, according to an Airbus training video and a pilot who spoke to the Associated Press. The case is looking like a pilot suicide. Apparently air accidents have been low in the past year, but we’ve had more than usual high-profile events. The chances of something adverse happening are vanishingly small. Nevertheless, I’m sure protocols and policies will now be reviewed. Germanwings is a budget airline owned by Lufthansa, a competent air line. My first paid work was in the Automotive Plant division of the PMG – later to become Telstra and Australia Post. I copied figures from operators’ returns onto a summary sheet, added them by hand and had them typed up to be sent off somewhere. I was told they would contribute to the graphs on the wall of a controlling engineer in Melbourne. There were no electronic calculators. Engineers used slide rules. That was in 1963. In 1964 I worked in a university library, where they were automating their loan system with punch cards and knitting needles. When I joined the Education Department in 1969 we had small committees because the minutes had to be produced using extra sheets of carbon paper in a typewriter. Photocopiers had not yet arrived. Since then robotics, automation and communications technology have brought vast changes to the work place in all sorts of fields. Another tsunami of change is about to hit us according to Oxford University expert Michael Osbourne. He said that 47% of jobs in the US were at high risk of being replaced by automation within a generation. “Increasingly, algorithms are able to perform not just routine manual labour in the way they have done in the past but also cognitive labour in a way that makes it much more difficult to draw that line between what is automatable and not,” he told 612 ABC Brisbane. Jobs linked to data entry, accountancy and heavy vehicle driving would dramatically decrease and in some cases vanish completely. Driverless vehicles would be made possible as massive low-cost data storage capacities allowed for the creation of highly detailed 3D maps – an area already being explored by large mining companies, he said. 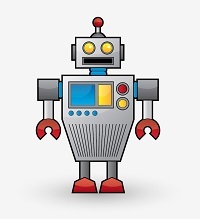 The more creative you are, the safer you are from automation. He stresses that he is talking about technological capacity over a 20-year time period. What happens in reality will depend on social acceptability and other factors. The construction industry is one sector being affected already. Modules of bathrooms and kitchens are being prefabricated offsite. In fact 30 stories of a building can be put up in 15 days as sections come pre-wired and pre-plumbed. John D has also kindly sent me a link to ABC Fact Check which has detailed 11 ways the Australian workplace has changed. Since the statistics show that readers tend not to follow links, I’ve transported the text here, for your interest. Fifty years ago the expectation was that a man went to work and a woman stayed at home. But that has changed dramatically. In the years between 1961 and 2011, the proportion of women in the workforce almost doubled from 35 per cent to 59 per cent. Until 1966 married women were not employed by theAustralian Public Service and single women were forced to “retire” when they married. In the 1960s Australia was moving from being a primary producer still “riding on the sheep’s back” to an economy with a strong manufacturing base. In 1966 more than 25 per cent of the workforce were in manufacturing, but that’s fallen in the past few decades. Now just 8 per cent of workers are in manufacturing. The rise and fall of trade unions in Australia has been dramatic. In 1912, 30 per cent of workers were members of trade unions, by 1961 that had reached 61 per cent, but by 1999 that had fallen to 26 per cent, and by 2011 it had dwindled to around 18 per cent. Child labour was not uncommon for much of the 20th century. In 1940, 6 per cent of all factory workers were under the age of sixteen, fifteen in NSW. The number fell sharply after World War II to 2 per cent of factory workers in 1948 and less than 1 per cent by 1968 as higher levels of employment for adults let them keep their children in school and out of the workforce longer. One in 10 full-time workers in Australia earns more than an average of $2,548 per week, and one in 10 earns $800 per week or less. The rest are somewhere in between. The Australian workforce is split fairly evenly along gender lines. Of the approximately 10 million employees in Australia, 50.5 per cent are women and 49.5 per cent are men. But men still tend to earn a lot more than women – an average of $1,429.80 for male employees, compared with $940.20 for female employees. That in part is due to the number of hours worked: 76.6 per cent of men work full time compared with 43.7 per cent of women. Mining is the best paid industry, where average earnings are $2,499.60 per week, compared with the lowest paid industry, accommodation and food services, where workers make an average of $561.60 per week. The largest industry is health care and social assistance, making up 12.8 per cent of employees. Managing is the best-paid occupation, with average weekly earnings of $2,113.80. Sales workers get the lowest average pay, with just $628.60 per week. The occupations with the highest rates of work-related injuries and illness are machinery operators and drivers, followed by community and personal service workers. The industries with the highest rate of work-related illness or injury are manufacturing, followed by transport/postal/warehousing and agriculture/forestry/fishing. Education matters. Of Australians with a tertiary or higher education, 83 per cent have a paid job, compared with 59 per cent of those without an upper secondary education. Australian jobs are pretty secure compared with other nations. Australian workers have a 4.4 per cent chance of losing their job, which is lower than the OECD average of 5.3 per cent. Barrie Cassidy has called it a breathtaking shift in economic management. A bit like the old story of the frog that gets boiled alive because the temperature of the water in which it sits rises only gradually, we don’t seem to quite be able to take in the growing realisation that we actually are being governed by idiots and fools, or that this actually has real-world consequences. We finish the week with a Prime Minister who has lost his bundle and is making policy and political calls that go beyond reckless in an increasingly panicked and desperate attempt to save himself; a government that has not just utterly lost its way but its authority; and important policy debates left either as smouldering wrecks or unprosecuted. When debt under Labor reached 13% of GDP Abbott characterised it as a “disaster”, likely to send the economy down the Greek path. Suddenly, with 20% of his 2014 budget savings stalled in the senate, we have “done the heavy lifting” and the prospect of debt 50 to 60 per cent of GDP “is a pretty good result looking around the world”. It shows the “currently legislated” path reaching a deficit of 6% of GDP in 40 in years. Standard and Poor have warned that if debt, federal and state, goes beyond $30 billion we can expect to lose our prized AAA credit rating. Laura Tingle and Phillip Coorey say that the federal budget’s forecast bottom line has gone backwards by at least $80 billion since the Coalition came to office. In Labor’s last financial year in office, spending exceeded revenue by 5.4 per cent. This year it will exceed it by 13 per cent. The budget does have to be fixed. The Reserve Bank Governor, Glenn Stevens, recently warned that in a recession a deficit of 3% of GDP will quickly balloon out to 6 to 7%. That allows no space for government stimulus of the economy. Treasury’s most conservative estimate has the concession for contributions to super funds costing $15.5 billion this financial year, climbing to $18 billion over three years. The tax concession for the earnings of funds costs $12 billion and is set to almost double to $22 billion. By way of comparison, Medicare costs $20 billion. As he says, each one of these will meet objections from tax payers. But then the art of taxation was always plucking the goose without too much squawking. 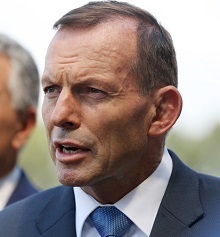 A prime minister fighting for political survival appears to have thrown in the towel. 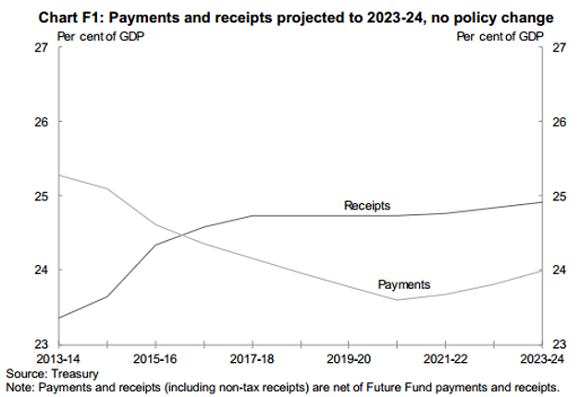 Update: I meant to mention that Labor had the budget remaining in surplus over the remaining part of a 10-year projection in order to show how Gonski and NDIS would be paid for, whereas Abbott/Hockey planned to slash schools and Hospital funding by $80 billion dollars. Abbott is now saying that a surplus will be achieved within 5 years, whereas Mathias Cormann is saying “as soon as possible”. See also They tell us lies, but are they clunkheads? “We’re realising that the East Antarctic ice sheet’s probably not the sleeping giant that we thought or at least, the giant’s starting to twitch and we’re concerned,” he said. 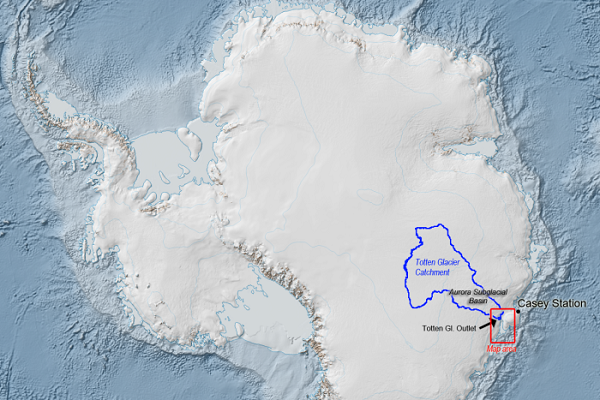 Essentially with East Antarctica on the move, estimations of sea level rise this century could be underdone. We simply don’t know. The Federal and Queensland Governments have together released the final version of the long-term plan for the Great Barrier Reef. The Reef 2050 Long-Term Sustainability Plan satisfies one of the key recommendations made by the United Nation’s World Heritage Committee and forms a key plank in the Governments’ bid to avoid the site being declared “in danger” by UNESCO. The report warns climate change is the biggest long-term threat facing the reef, while the immediate pressures include water quality, which has declined due to nutrient and sediment runoff from agricultural production. Previously, a draft version of the report was criticised by some scientists as being a plan for sustainable development rather than protecting and conserving the reef. The Queensland Government also sought urgent changes to the draft, to include its $100 million election commitment to improve water quality. According to a new French law approved on Thursday, rooftops on new buildings in commercial zones across France must either be partially covered in plants or solar panels. France has lagged behind other major European countries like Germany, Italy and Spain in solar power development. As of last summer, France had just over five gigawatts of photovoltaic capacity, accounting for around one percent of total energy consumption. Germany has nearly 40 GWs installed. 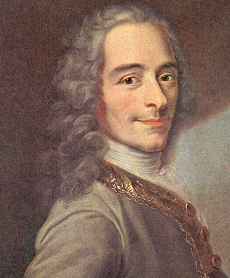 France has relied on nukes for 83% of its power. 4. Are the UK’s emissions really falling? The UK’s production emissions have fallen fast (dark blue area), but imports have offset much of the gain (lighter blues, purples and grey area). Clearly things changed after the GFC in 2008. Germany plans to force operators of coal plants to curb production at their oldest and most-polluting power stations, as part of efforts to achieve its climate targets, senior government sources said yesterday. Under the measures, the government plans to allow coal plants to produce 7 million tonnes of carbon dioxide per gigawatt of installed capacity, but any produced above that level would be subject to a fine of 18 to 20 euros per ton. 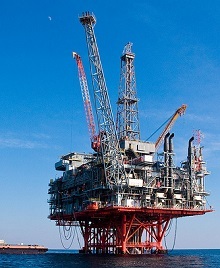 Seven are energy companies, three are miners. However, if you took the emissions generated from the products they produce, a very different picture would emerge. Rio, for example comes fourth with emissions of 18 million tonnes of CO2 last year. Yet Rio’s customers burning coal produce a further 129 million tonnes. That’s according to the Climate Council, (but see Item 8 below). “Higher surface temperatures can mean that you have higher wind speed and more damaging rainfall,” Amanda McKenzie from the Council said. Ms McKenzie said rising sea levels would multiply the damaging effects of cyclone storm surges. Cyclone Pam, a category-5 storm with wind gusts reaching 300 km/h, struck Vanuatu on 13 March 2015 leaving twenty-four people dead, 100,000 people homeless and up to 70% of the nation’s 69,000 households damaged. Stefan Rahmstorf at RealClimate takes a look at whether climate change had an effect on Cyclone Pam. My take is, quite possibly, but we can’t know for sure. The basic problem is that the satellite record only goes back to around 1980, which is not long enough, and only in the North Atlantic are cyclones surveyed by aircraft and then only if they threaten populated regions within a few days. A study by Kossin et al (2013) looked at the satellite data record from 1982 to 2009 and found an increase of 2.5 m/s per decade for high intensity events (Pam appears to have reached an intensity of around 75 m/s). Other factors to look out for include the amount of rain delivered, changes in genesis locations and tracks, and diameters, all of which should be affected by climate change. Haiyan and Pam, two of the most severe tropical cyclones on record, have struck the western Pacific in the past 16 months. “I always thought Malcolm would be around a lot longer. I must say, I wished he had been. “Notwithstanding a controversial prime ministership, in later years he harboured one abiding and important idea about Australia – its need and its right to be a strategically independent country. 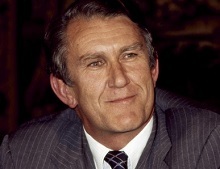 In office, Fraser was a staunch conservative on economic policies, an opponent of deregulation – and he was was criticised by his colleagues for lacking reform zeal. But he continued many of Labor’s progressive reforms. In 1976 he established the family court of Australia and federal court of Australia; granted the Northern Territory self-government; passed the Aboriginal Land Rights (Northern Territory) Act; created the position of federal ombudsman and established the ABC’s FM radio service. 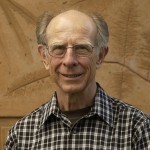 The next year, he established the National Aboriginal Conference and SBS. In 1979 the Fraser government established the Australian Refugee Advisory Council to advise it on the settlement of refugees – many of whom had been arriving as “boat people” from Vietnam since 1978. After criticising the Liberal party’s direction during the years of the Howard government, Fraser finally quit the party when Tony Abbott came to the opposition leadership, unhappy with Abbott’s rejection of emissions trading. He said the Liberal party was no longer a liberal party but instead a conservative party. Fraser campaigned assiduously for human rights and attacked the party’s stance on immigration and refugees. Australia can be justifiably proud of an approach to economics that is squarely between Europe and the United States. The US, on the whole, champions free enterprise despite the social costs; Europe sees a much larger role for the state, even if that inhibits free enterprise. 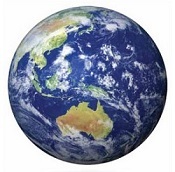 The Australia in which we live today is somewhere in between. 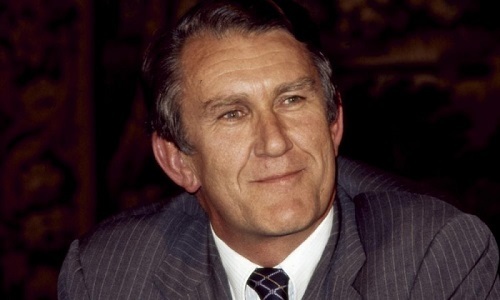 When Malcolm Fraser became prime minister that was all up for grabs. We could have become “old Euope” or veered onto a radically individualist path in response to the debacle that came before. Fraser helped us chart a middle course, and we should be very grateful for that. Fraser was ruthless in gaining power, first in the coup that unseated Gorton as PM, then doing over Billy Sneddon for the Liberal leadership and later in the famous dismissal of the Whitlam government. I hated him tribally for that, and disliked him for his apparent aloofness and arrogance, but later came to see him as a man of principle and values. There’s more on his legacy at the ABC and heaps of articles just about wherever you look! Probably the best article that takes you to the complexity of the personality and his politics is Guy Rundle at Crikey, unfortunately paywalled. A remaining mystery is what really happened that night in Memphis, when Fraser turned up in the foyer of a seedy hotel without his trousers. Update: Must read on Fraser at The Piping Shrike.